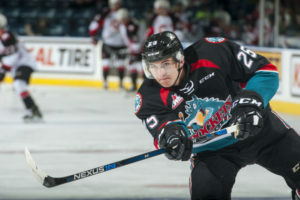 With the 14th Pick in the 2017 NHL Entry Draft the Tampa Bay Lightning Have Selected Callan Foote From the Kelowna Rockets in the WHL. The son of NHL star Adam Foote, Callan Foote looks to follow in his father’s footsteps as he gets his career started in Tampa Bay with the Lightning. Though Foote has some NHL lineage, he plays essentially the exact opposite game from the game his father played. Adam Foote played a physical game and was known for his brute force. Callan, on the other hand, is a very skilled defender who could be a top-pairing player one day. With strong instincts and the ability to play in multiple schemes while moving the well in the transition game, Foote fits exactly into what the new mold is for NHL defensemen. One comparison I’ve heard for Foote is Dougie Hamilton and it’s not a bad one. Foote’s a right shot, rangy big defenseman. He doesn’t play incredibly physical yet, but he has the frame to potentially bulk up and battle against bigger players. He’s been very good as a proverbial man among boys in the Western Hockey League. He’s likely ready for bigger challenges. The Tampa Bay Lightning are one of the more stacked teams at the forward position in the NHL. With a strong offensive group that features Nikita Kucherov, Steven Stamkos, Tyler Johnson and Ondrej Palat, the Lightning’s blueline is now starting to take shape as well. Victor Hedman, arguably one of the best defenders in the entire league, could be joined by Anton Stralman, Mikhail Sergachev and now Foote for years to come. The Lightning have been looking for good young blueliners for a while and Foote has the potential to be a star in the NHL. With Hedman and Sergachev, however, Foote won’t have to become a bonafide top pairing defender to be a good pick for the Lightning. If he becomes even a solid second-pairing player, he’ll be a great pickup for the Lightning.